First came a lesson in authenticity. Korea began enjoying a yogurt boom when it introduced 100% pure yogurt with 100% fresh fruit toppings. 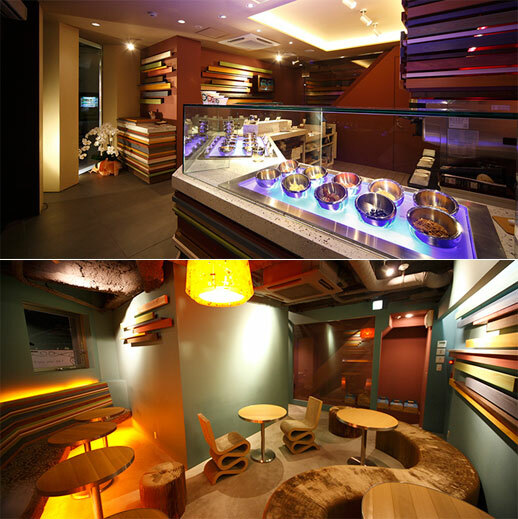 Then came the opportunity of applying that success to creatives, when Korean entrepreneurs, staying true to the principles, opened yogurt shops that emphasized award-winning interior design. Studies show aesthetics comes first when it comes to attracting people. The stimulated senses from both the taste and experience in being in an inspiring space induced long lines at such yogurt destinations as Pinkberry. Of course, one it became a chain it started to lose its authenticity, but that’s another story. Now, what better way to appeal to creatives than allowing them to create their own yogurt menu? So in came Yogurtland with their yogurt bar, allowing people to concoct whatever they wanted, paying by the ounce. Finally, since creatives are eco-minded, we now have Sno:la, pretty much as green as you can get for any retail/food establishment. It’s plastic free â€“ all containers and utensils are biodegradable and compostable, the countertops from recycled computer chips, the tabletops from fast-growing eucalyptus and recycled cardboard, the wall decorations from recycled wood, and the concrete floors are soy-painted. Solar panels juice the yogurt machines. To top it all off, the yogurt is organic with natural sweeteners and toppings, and 1% of Sno:la’s gross goes to Slow Food USA. The first store even opened in Kyoto, Japan, to symbolize the Kyoto Protocol. The next innovation? Yogurt shop as crowdsourced, local, neighborhood VIBE rather than Starbucks-modeled international chain.